We find out why Limelight magazine is Australia's essential guide to classical music from the new editor Jo Litson. Can you describe Limelight magazine? Who is it for and what does it cover? 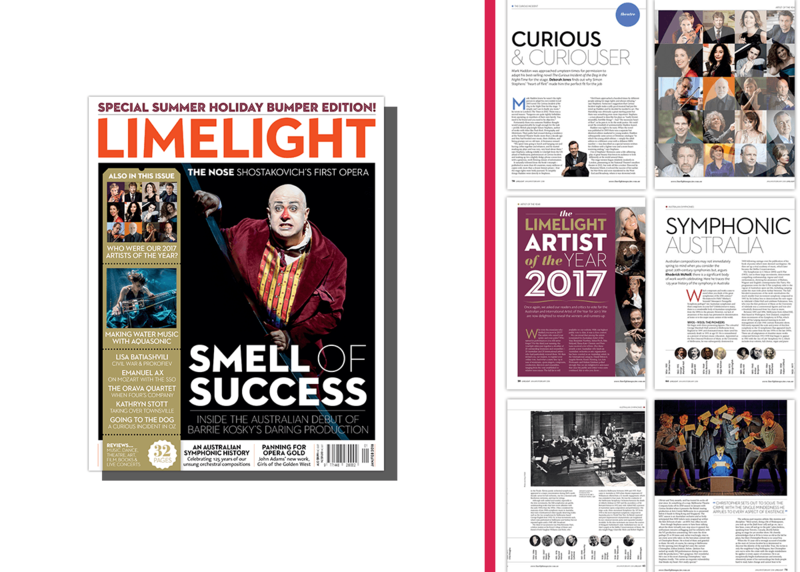 Limelight is a magazine dedicated to an informed, lively coverage of classical music and the arts, with news, in-depth articles, interviews, reviews and even a monthly quiz and competitions relating to classical music, opera, theatre, musicals, dance and visual art in Australia and overseas. Our writers are passionate and knowledgeable, sometimes opinionated but never dull. As many other media outlets are shrinking their arts coverage, we feel we have an increasingly important role for anyone interested in the arts. What’s more, in addition to the magazine we have a new, bustling website with an ever-growing readership. With the change of a new editor should long-time readers of Limelight expect a revamp of the magazine? I don’t envisage a radical revamp of the magazine. We may expand our coverage of theatre, dance and visual arts a bit more but classical music and opera will remain our central focus. We are discussing some new columns, including an occasional look behind-the-scenes to give our readers an insight into aspects of production they might never have thought of. We also have several other ideas in the pipeline, but essentially we are proud of the magazine as it is and won’t be changing it a great deal. The bigger changes will be happening in the digital sphere on our website. What’s the best part of being the new editor of Limelight magazine? I have loved the arts for almost as long as I can remember (having fallen headlong in love with theatre when I was in a school play) and I have always loved Limelight as a reader. Having written for it as a contributor and then worked as Clive Paget’s Deputy Editor, I feel honoured and very lucky to now be Editor of a publication I believe in so strongly. We get to talk to some of the world’s leading musicians, performers and artists, which is always inspiring, and we are also incredibly lucky to be invited to attend numerous concerts and stage shows. On top of that, I have a small but fabulous editorial team. Everyone is really committed to what they do, and lovely to work with. This month’s is the one double issue of the year – our bumper January/February holiday issue ­– so there is so much to choose from it’s hard to say. I think Justine Nguyen’s story about Danish music ensemble Between Music, who have developed special instruments and techniques to play music underwater in their show AquaSonic is fascinating and a bit off-the-wall. And I had a wonderful time interviewing the brilliant director Barrie Kosky about his production of Shostakovich’s first opera The Nose. But there are so many interesting stories (truly!) that it’s hard to pick. What is one piece of classical music you think everyone should listen to? Oh Lord, that is a big call! All I can say is that I absolutely adore Brahms’ Violin Concerto and have done since I first heard it. There’s a lyrical theme in it introduced by the violin and picked up by the orchestra that is so lovely, it makes my whole body feel like it’s going to melt. If Limelight had a motto what would it be? Get closer to the music. And subscribe!